Brigadier General John F. Kinney, a decorated Marine Corps aviator and engineer who played a key role in the defense of Wake Island by an outmanned U.S. garrison facing a Japanese amphibious attack at the outset of America's entry into World War II, died Thursday in Cupertino, California, at age 91. General Kinney, then a Second Lieutenant, arrived on Wake Island with a squadron of 12 Grumman Wildcat fighter planes less than a week before the December 7, 1941, attacks on both Pearl Harbor and Wake Island. The Japanese air raid on Wake Island's tiny airstrip left only four of the squadron's fighters fit to fly. The unit's engineer and all of its plane mechanics were killed in action. Lieutenant Kinney flew combat attacks against Japanese warships and supervised repairs as the squadron's replacement engineering officer, keeping the four remaining planes in operation by salvaging parts from destroyed aircraft. On December 11, the island's combined air and shore defenses pushed back an amphibious assault, sinking two destroyers. Following a second assault and the surrender of the Wake Island garrison on December 23, Lieuenant Kinney became a prisoner of war and was transported to Japan and then to Shanghai. He was interned in Kiangwan Prison from December 1942 to May 1945. On May 10, 1945, as a train was moving prisoners to another camp, Lieutenant Kinney jumped off and escaped through China, a journey that took 47 days. He was reunited with U.S. troops and arrived home in Washington state on July 29. "He and four other Marines jumped out of a train and were able to make contact with the Chinese communists, who took care of them and led them through the backwoods of China," said his wife, Bonnie (LaVonne) Heinsen Kinney. 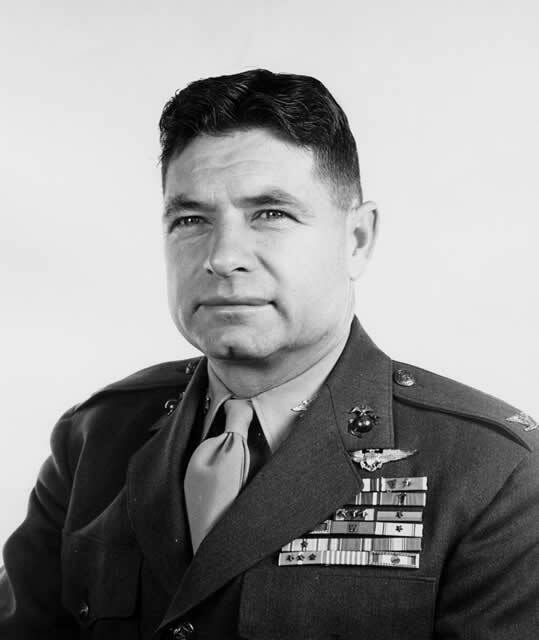 In 1946, he was placed in command of the Marine Corps Aviation Technical School, where he and other instructors built the first jet engine test cell in the Navy. He was promoted to Lieutenant Colonel in 1949 and attended the Air War College, graduating in 1950. During the Korean War, he was assigned as operations officer of Marine Air Group 12, which served in Wonsan, Korea, and later in Pusan, Korea. He was instrumental in identifying problems with jet aircraft and flew with his squadron along the Yalu River. He received the Silver Star for flights in the Yalu River area. He also received the Legion of Merit and the Bronze Star for service in World War II, and another Legion of Merit and the Distinguished Flying Cross, among other awards, for service in Korea. He rose to the rank of Colonel in 1956, and received his helicopter pilot designation the following year. He took command of a helicopter group stationed in Okinawa and the Philippines. In 1959, he retired from the Marine Corps with the rank of Brigadier General. General Kinney later worked as a test pilot for two aircraft-makers and as an engineer for Lockheed. He retired from Lockheed in 1980. In 1993, he built his home in Portola Valley, where he lived until 1997. In 1995, he co-wrote a book about his wartime experiences, "Wake Island Pilot: A World War II Memoir." In addition to his wife, General Kinney is survived by stepchildren Don Heinsen of San Jose and Candyce Heinsen Carter of Reno. His first wife, June Spenser, died in 2003. She and Gen. Kinney married in 1945. General John F. Kinney was a Grumman F4F-3 Wildcat pilot assigned to VMF-211 on the pacific outpost of Wake Island in late 1941. He participated in the defense of Wake Island until it fell to Japanese forces in late December. During the defense of Wake Island, then Lt Kinney was responsible for keeping the remaining four F4F-3's operational under very difficult circumstances. Kinney was a prisoner of war for most of World War II until his daring escape and return to allied control in China after 3½ years of captivity. General Kinney flew combat missions during the Korean War. He also participated in the development of Marine Corps jet aviation. Later in his career General Kinney transitioned into helicopters adding to the development of this new aircraft. General Kinney's many awards include the Silver Star, Legion of Merit, the Bronze Star, the Distinguished Flying Cross, thirteen Air Medals, the POW Medal, and the Wake Island Expeditionary Medal.